Makes: 2-4 Servings. Under $10 & Under 10 minutes cooking time! This recipe is very low in sodium, lactose and fat and is very high in hearty-healthy Omega-3 fatty acids, and is super easy to prepare! You will need: Trader Joe’s Frozen Plain – Ahi Tuna Steak (around 1 pound), Trader Joe’s Israeli Couscous (purple box), Trader Joe’s Island Soyaki, package of mushroom, 1 yellow onion, chopped garlic, extra virgin olive oil and unsalted butter. Everything was purchased at Trader Joe’s. Directions: Transfer Ahi from the freezer to the refrigerator allowing it to slowly thaw over a few hours (maybe do this in the morning before you leave for work.) Once thaw, poke the ahi with a fork to tenderize a bit, then coat the Ahi with Soyaki and allow to marinade for at least 10 minutes. In the meantime, cook the Couscous according to the directions given on the packaging. While couscous is cooking, sauté garlic, onion and mushrooms in extra virgin olive oil and butter until golden brown, then stir into completed couscous. Heat a skillet or grill until it is sizzling, then gently place Ahi steaks on. Allow steaks to cook equally on each side to your liking. For best results, sear for just under 2 minutes on each side. 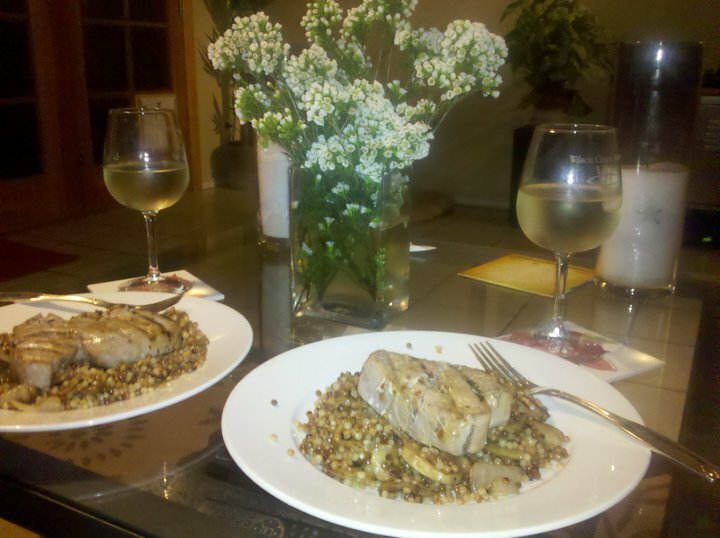 When both parts are ready, slice Ahi into thin strips and place them on top of a bed of couscous. Lightly drizzle Soyaki on top of dish for a little extra flavor, or add an avocado spread to compliment the tuna. Enjoy!